Does legal order always need the enforcement power of the State? The concept of private order says no. Private ordering is traditionally defined as the coming together of non-governmental parties in voluntary, self-enforcing arrangements. This Article radically expands the concept of private order to include not only individuals, but also governments themselves, arguing that the ingredients for private ordering exist in both spheres. State actors, perhaps even more so than individuals, are producers of private order in that they regularly establish sophisticated legal order in the absence of centralized enforcement. 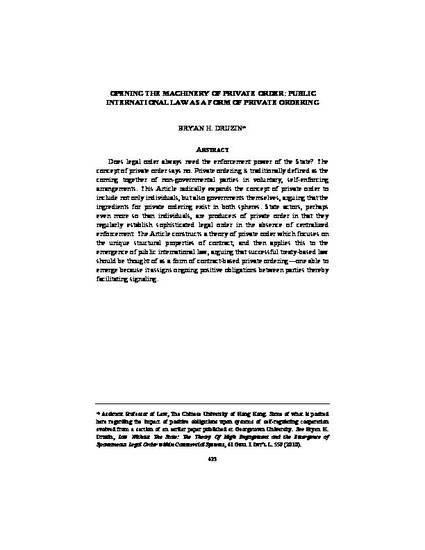 The Article constructs a theory of private order which focuses on the unique structural properties of contract, and then applies this to the emergence of public international law, arguing that successful treaty-based law should be thought of as a form of contract-based private ordering—one able to emerge because it assigns ongoing positive obligations between parties thereby facilitating signaling.